We stood in a living room furnished with antiques and, on small tables winging the brocaded sofa, delicately fanned displays of recent poetry books. It was an early autumn night in northern Indiana, after the slate of academic events had recommenced on campus but before the weather had turned nasty enough to ensure no one attended them. I found myself rushing to finish my second beer, having just come from the sparsely attended poetry reading whose featured author was the occasion of this reception. When composed of ambitious MFA students, and faculty members who have long known each other but seldom cross paths, such events invite harmless literary gossip and awkward, circuitous talk about gourmet cooking and other elements of what has come to be called “private” life. As it happened, the poet was exceptionally talented and, appropriately, a master of impersonal, cinematic blank verse narratives. Perhaps made too boisterous by this rarity of a rewarding and impressive poetry reading, I risked making my own formalist convictions known. A colleague of mine, himself the author of three books, was in turn provoked to make the following two statements: “Whatever everybody says, it’s not hard to write formal verse.” And, “My students can only express themselves in free verse.” My immediate impression was that he must be a lightweight, because only an easy drunk could expose himself to such obvious contradiction. If formal verse is so easy, why could not his students “express” themselves in it? I could, in a certain way, agree with both those statements and still insist that he has stumbled into a contradiction. There is a gorgeous convention in most ancient and medieval verse of noting in the poem the “difficult meter” into which the poet has fashioned his matter. These poets did not mean that this difficulty was the only one to be surmounted before one achieved great poetry, but they did want to insist upon the minimum of craft that ensured the identity of the work and their role at once. I find this especially touching in the Irish bardic verse, where the file is merely confirming that his prominent office in clan society is well deserved and stands alongside those of the warriors whose deeds he is charged with recounting. And of course one cannot avoid running across praise of properly executed “numbers” in Augustan poetry, which suggests just how scientific and precise the poets of that irrationally scientistic age meant to be about their versifying. These claims for the difficult craft of verse are valid insofar as they go. It takes work to learn to hear meter as it does to write it. But like grammar, once one gets the hang of it, it becomes very easy. Let me amend that last statement by removing the simile: versification is a branch of grammar. To ancient grammarians we owe our knowledge of classical prosody; Dante referred to poetic composition as grammar per se. One must know how to punctuate a sentence to write sound prose. One must know how to write a sentence in meter and, perhaps, in rhyme, to write verse (we shall return to this). But once one has learned grammar—including the grammar of verse—it becomes quite easy, and one turns not to other things, but to more things, which is what is meant by developing a style. One may write in form, after a few hard jogs, with ease; but style is the work of a lifetime, and few men truly live. Does this prevent “self-expression?” I should almost hope so, if only because it is so frequently discouraging to learn what most other human beings tote about inside themselves. But formal verse certainly does not prevent anyone, student or master, from saying anything that needs to be said. I have always been perplexed by those persons, like my anonymous colleague, who seem to believe that the writing of poetry is primarily about self-expression. I apologize even for noting my perplexity, for I am aware that many others have made the same complaint. And yet any professor of creative writing who believes it is his job to help his students to express themselves ought to recognize immediately that he is less qualified than a trained art therapist to do so—presuming, of course, qualifications obtain in such a neologistic profession. And he ought to recognize in addition that art therapists do not have anything essentially to do with art. In wartime, one may use a mattress as a barricade rather than as a thing on which to sleep; similarly, in desperate circumstances, psychologists may deploy art as a means to alleviate the murderous or merely “mopy” tendencies of a psychopath. But no intelligent person would change the definition of “mattress” to “that which is used for sleeping and the stopping of bullets,” any more than one ought to change the definition of “poetry” to “that literary genre written in verse . . . and also used for the soothing of backward children” (St. Hilary, ora pro nobis). If we are to take his statement more seriously, however, a problem still remains. Any statement in words in its essence expresses something, and since only human selves speak, poetry like any verbal construct cannot be anything if it is not a medium of expression. My colleague seems to have been arguing that his students could not get what they wished to express to pass fluently through this medium. If he were an instructor in philosophy, I should sympathize. After all, Kant’s obscurities launched a thousand ships of obfuscation from which philosophy in general has never fully recovered. In contrast, whatever the complexities of the reality he describes, St. Thomas Aquinas found a clear and efficient medium to express that reality—and, crucially, it is the clarity of Aquinas’ writing that helped ensure the soundness of the thought within it. If he were forced to write his articles on the Incarnation of the Word in Sapphics, more people might read Aquinas but even fewer should understand him properly. But this was a professor of the writing of poetry with which I was clinking glasses not, unhappily, the Angelic Doctor! That is, he occupied an institutional position that insisted there was some relevance to the medium of communication beyond its role as conduit of a certain propositional content. It has been my purpose thus far to resist the reduction of Marshall McLuhan that “the medium is the message.” I would not confuse form and content; they are merely the complementary conditions of each others’ existence. But we know from experience at least these two things: a) poetic form can and does add to the “content” of a work; by giving it shape it helps determine its existence; and b) apart from this entrance of form into content, poetic form is of its own intrinsic interest. As I have facetiously suggested, the professor of poetry writing may be incompetent to direct the content of his students’ writing (of itself, or to any particular end), but he has failed in the role assigned him if he does not, perhaps through long and tiring effort, impart to them the skills necessary to compose competently whatever thought they may wish to express in well-wrought verse. From an institutional perspective that is such a professor’s duty, and in this instance the institutional perspective is in the right. What a dereliction it was, then, to hear one such professor consider the difficulties of formal verse an imposition. 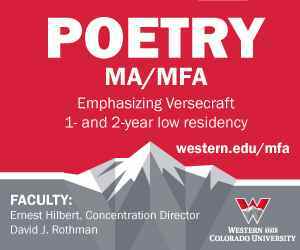 I have taught the writing of poetry for a couple years in my duties as a professor, and I have found it quite easy to bring my students to competence in the reading and writing of metrical poetry. In the early assignments, it is outright necessary to remain indifferent to the content of their poems, in order to isolate and develop their ear for meter and, eventually, rhyme. Those students who become good poets—and I have had a surprising number—do so, in part, because they have matter they deeply and for good reason wish to write about, and in part because they have sufficiently mastered the elements of form that they can turn it to the clear advantage of that matter. The former alone will not make a good writer, though as I have said it may make for some interesting writings. The latter alone will not make a good poet, though without it one is not a poet at all. This is perhaps a good moment to digress by way of protesting against the old canard that meter makes one distort language in order to fit its pattern. If the medium of a poem is nothing but a burden cast upon the Platonic ideal of its content, then I must confess this is a just complaint. Let us, in that case, all pray for the end of all flesh and our restoration to the changeless plane of the exemplars. But we are surely all in agreement that poetry qua poetry is in large part its concrete individual expression. If so, we may freely admit that those of limited ability with meter or rhyme will often write bad verses merely because they are struggling to find an apt polysyllabic to fill out, say, the stress of one iamb and the entirety of the next; or because they have chosen to end one line in “night” and so feel compelled to rhyme it with “light.” But quite often someone is accused of writing bad poetry merely because he has made a sentence sound awkward by the standards of business prose in order to satisfy his meter or his rhyme. They sin, it appears, in sacrificing efficiency to formal completion. This can hardly be the case. Free verse poets no less than New Formalists (or any other poet worth considering) recognize that the form of a poem is of immense importance. If one is writing in formal verse, satisfying the exigencies of meter and rhyme is therefore a good in itself. As a good craftsman, one should be reasonably content to throw in a trite rhyme, or even a bad one, now and again, purely for the sake of maintaining the scheme. How absurd to think one would spoil a ballad well on its way to rhymed perfection merely because the only suitable rhymes for “asphyxiate” gnarl and twist the syntax of the sentence. The response to this may be, “Fine, but I do not consider rhyme a good in itself.” To which I can only say that, in this instance, one has simply confessed not to like poetry. While classical verse did not rhyme, and while much verse in the modern languages does not, poetry, rhymed or blank, makes its form audible—and rhyme is the conceptual archetype, if not the historical prototype, for poetry’s audible form. In the present age, very few people do like poetry. I wish they would not tear down the whole craft of a literary genre in order to remake it into something they can like. Perhaps an art therapist could help them with these destructive urges. By not quoting more, I make the sense of this passage hard to get at, but it is not the sense of it I contest. Her translation is, qua translation, a fairly clear, bad translation of Dante. But look at the lineation, the “it’s in,” indented in the fashion traditionally reserved to indicate a spill-over line, where the margins call for it. We have no reason, based upon the erratic lineation of the rest of the translation, to believe Graham has only created such a preposterous line as “it’s in” because it spilled over from the previous, but did not belong to the next. She writes in free verse; according to what principle has she arrayed this line thus? To what end? Free verse did not, therefore, open poetry to a greater variety of expression, though it certainly made it more various of expression than late-Victorian (Georgian) poetic diction and subject-matter conventions seemed to allow (an appearance utterly belied by the great Georgian poets Edward Thomas and Wilfred Owen). To the contrary, since free verse robbed poetry of its unobtrusive but commanding requisite of meter, its practitioners were forced to reach ever farther into the darkness for some element of speech that might be distinctively poetic. They hit upon fragments like that I have quoted just above, but since this is to be found as a standard element of good prose (or as a pervasive element in Hemingway’s prose), they had to reach farther. Finally they grasped some dark matter: and that was the idea of constituting poetry as that which was so jagged and broken and inefficacious at communicating a wide variety of thoughts and rhetorical effects, that which was so useless for any other kind of expression besides emotional portentousness, that it just had to be poetry. In sum, with meter and rhyme, many poets also threw away grammar. I do not call poets to reassume the chains or nets of formal verse as if beckoning they return to slavery. Rather, I insist that grammar is essential to poetry because it offers one freedom, in the same way our speech offers us more freedom of communication than the grunts of a hog or the barks of a dog. And grammatical poetry, in order not to be merely lineated prose, really does depend on the backbone of meter and, in our language, most often, the forked legs of rhyme. Mine is not an authoritarian criticism, commanding poets return to explored and exploded techniques that will no longer harm one’s sense of comfort in a comfortable world; I rather have the privilege of proclaiming an invitation to the liberation of well-cultivated grammar and verse. The freedom of free verse is anarchy like any other anarchy, eschewing form for formlessness; liberty requires discipline and rewards it with accomplishment. Formal verse offers poets the only kind of freedom that actually exists: the freedom to be determined.